Choice of equipment: I was tempted to get an android tablet such as the Nexus and use charts from “Visit my Harbour”. However having decided to buy the Garmin Echomap, and since my home (and work) computing has for many years been Apple Mac based, I am using an iPhone 5s (4g version) along with the Macbook Air laptop which I already owned. Installation: The iPhone lives in a “LifeEdge” waterproof case which seems very good and allows USB connection without removing the phone. Apart from using it as a smart phone, the iPhone can be used as a “personal Hotspot” to provide wi-fi internet access for the laptop computer. Obviously this depends on the available phone coverage and I’m using EE pay-as-you-go which allows 3G and 4G access where available. An EyeTV “Hybrid” USB TV tuner with a Banten 331/1 amplified TV aerial mounted on the boom gallows allows the laptop to be used as a TV. Internet: Provided internet access is used for e.g. getting met charts, viewing rain radar, or checking “xcweather” current wind observations, the amount of data downloaded is small and the cost was very cheap (it’s now gone up to £10 per month). Phone coverage is good around Southampton and the Solent but I know that there are places going west along the coast where it is poor to non-existent. Using the laptop to access the internet via the phone is much easier for web sites such as the Met Office rain radar which are poorly designed for viewing on a mobile phone. Other iPhone uses: the iPhone has a flux-gate compass utility (to use it as a sighting compass hold to your eye and tap the screen – you can then read off the bearing) and the same app also displays your lat/long (from the GPS). 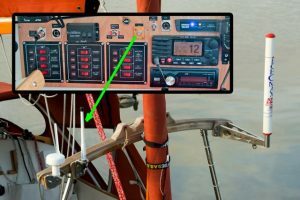 It, and the lap-top, run the Nav-link software from Digital Yacht which comes with a full set of charts and is integrated with the camera to allow buoys to be identified. 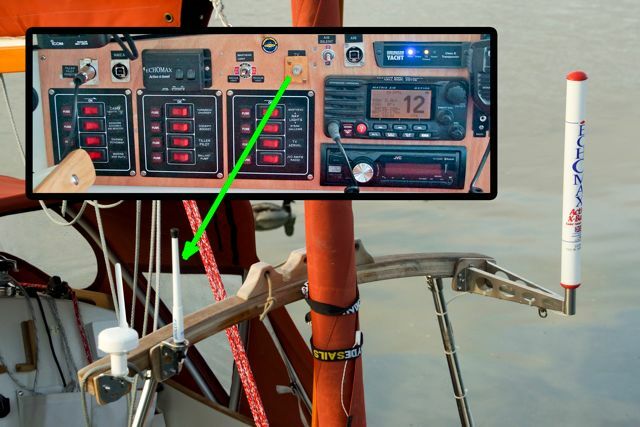 This also displays land details and provides a backup for the chart plotter. I also have off-line Ordnance Survey maps for the local area on the phone. Page 2 of the compass app is a “spirit level” useful for e.g. mast rake measurement. TV: I get a good TV signal in Southampton and it was OK at the mouth of the Beaulieu River and in Chichester Harbour; I haven’t tried it elsewhere; the idea is to have another source of graphical weather forecasts and another source of entertainment if I get storm-bound somewhere! The alternative, streaming TV over the internet via phone, would result in prohibitive data costs.